A union says it will instruct members to wear dresses if a dispute over a hospital porter suspended for rolling up his trousers in hot weather is not resolved. Michael Wood, a porter at Watford General Hospital, said he was facing disciplinary action from his employers Medirest. The company says porters should "wear appropriate uniform at all times". The GMB said it would tell porters to wear dresses if he was not reinstated. The row follows a successful protest by boys at protest on Thursday by about 30 boys at the ISCA Academy in Exeter who wore skirts to school because shorts were not part of the school's uniform. The school has now changed the rules meaning boys will be allowed to shorts in lessons from next year. Union official Mick Dooley said: "What we're hoping to do is get round the table and get Michael back to work, failing that, the chief executive of Watford General Hospital, [is] going to see her porters wearing dresses. "We're going to put out a message to porters [to start] wearing dresses and start wearing skirts." 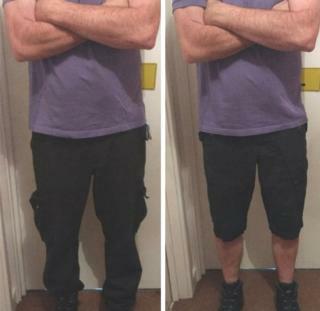 Mr Wood, 46, said he rolled up his black-coloured polyester trousers to three-quarter-length on Wednesday - the hottest June day for 40 years - but was called to the office and asked to roll them down again. When he said he "could not promise" not to roll them back up, he was sent home. "Our health and safety is paramount in the hospital, when you're struggling to work when you're sweating, you become irritable and argumentative," Mr Wood said. "I wouldn't mind wearing a dress - at least I'd be cool." On Wednesday, temperatures in nearby Harpenden peaked at 31.5C. Mr Dooley said: "Because of the unusually high temperatures, the NHS managers in Watford General have adopted a reasonable approach towards their workforce. "However, Medirest consider suspending safety reps is the preferred option." He said Mr Wood had been "treated unfairly" and "should be reinstated immediately". Medirest said it would be inappropriate to comment on an individual case where an investigation is ongoing but added the "health and safety of our colleagues is always our number one priority". "Due to the nature of their job and health and safety requirements, it is important that porters wear appropriate uniform at all times," a statement said.